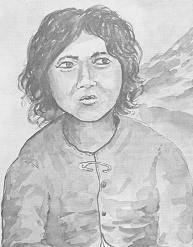 Meena lives on a mountainside in Nepal, a tiny kingdom located between China and India. 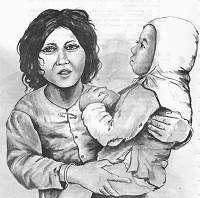 The people in Meena's country are generally very short and have pretty brown skin, dark eyes, and black hair. Nearly all of the Nepali people climb mountains. 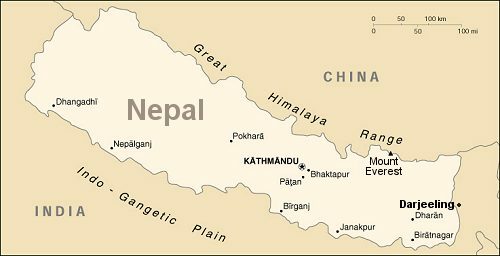 In fact, they have to if they ever go anywhere, because Nepal is covered with the highest mountains in the world. Like most of the people in Nepal, Meena's father is a very poor farmer. Since their little farm is on the side of a steep mountain, he has to make small terraces of flat land on which to grow his crops. He hopes one day they will be able to afford a water buffalo so he will not have to plow and dig the land by hand. Meena's house is made of bricks covered with a mixture of cow dung and mud. The straw roof must be replaced every few years to keep out the monsoon rains. The lower story of the house is just one big room with a campfire in the middle. At night Meena sleeps on a straw mat near the fire. The whole family has always slept in the same room together. As the morning sun climbs slowly over the mountaintops, the chickens are put out of the house amidst a flurry of feathers and cackling and clucking. To prevent wild animals such as mongooses, tigers, or jackals from eating them, they are kept in the house at night. At dawn each morning, having taken care of the chickens and started a fire, Meena and her sisters go down the mountainside to fetch water. At the local water tap the girls fill their large, handmade clay pots, then carry them slowly back up the trail to their home. This will be the family's water supply for the day. Having fed the goats, Meena goes out to gather cow manure from different mountain trails. The manure, which is considered "clean" because it comes from "holy" cows, is then mixed with mud and spread on the floors in Meena's house. This is the way Nepalis wash their floors! To put cow dung on the floor is called "lipnu." Do you like to camp out and cook your food over a campfire? Meena's family cooks over a campfire every day right inside the house. Her father and brothers are responsible for bringing the firewood which they cut up with big Nepali knives called kukuris. Breakfast time finds the entire family sitting on the floor and eating with their fingers. Meena's family can afford only two meals a day — eating rice, lentils (like split peas) and spiced vegetables at each meal. Two or three times a month they eat meat with their meal and occasionally they can afford fresh fruits or eggs. Meena has never eaten cake, or ice cream, or candy bars. 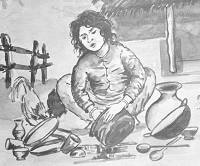 After meals Meena washes the dishes outdoors by the side of the house. Instead of soap she uses ashes from the fire to clean them. Some evenings Meena plays with her friends. Since none of the children have toys, they make up various group games to play. They are all very poor — most of them do not have shoes and most cannot afford to pay the 75 cent fee each week in order to attend school. Only a few of the more fortunate ones will ever learn to read and write. But many evenings the children are too busy to play. They are working in the fields, or helping grind wheat to make flour, or watching the younger children while mother cuts grass off the steep mountainside for the cows. Here Meena is helping her father farm. 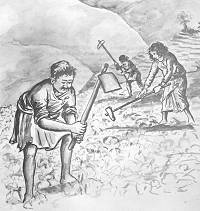 As he plows the ground by hand, she breaks up the clods of dirt behind him. In Nepal, farming is a family affair. Now it is time for "puja." Puja means worship in the Nepali language. Every day Meena prays to a small bronze god in her house, and during the week she often goes with her sisters to the village Hindu temple. There she gives a few pennies or a handful of rice to the ugly stone idol. She has always been taught that these man-made idols are really gods and that they will be angry with her if she does not worship them often. These gods are very mean and ugly, and deep down in her heart Meena is afraid of them. Of course, she would not tell anyone, but deep down inside she does not really believe that God is a bunch of cold, hard statues. But... these are the only gods she knows about. Meena is afraid of growing up. Nobody remembers just when she was born, so she is not sure of her age. But she knows that when she is about fourteen her parents will make her marry a man she never met before. She will have to live with his family then and wash the clothes and cook the food for the whole family. Will the man and his family treat her well? Often she worries about that. Also she is afraid of growing older because she does not want to die. Though her life is not very happy, the thought of death is terrifying to her. What happens after death? Since life is so difficult and unhappy, is there a possibility of happiness after death? If so, how can one find out about it? These questions arise, unanswered, to haunt her from time to time. It was a happy day for Meena when her "Daju" (big brother) returned from serving in the army. He had been gone two long years — the first member of her family to travel away from their village. The experiences he had had and the sights he had seen while in big cities were so exciting to hear about! He showed Meena an army boot and explained, to her surprise, that nearly all the people in big cities wear shoes or boots made of leather! ("What wealthy people must live in cities!" Meena thought to herself.) He told her of a big white box with a door on one side. The inside, he said, is actually cold all the time. He told her how, when placed in the box, food is kept for days without spoiling. She was amazed at such a magical device. One thing "Daju" related really troubled Meena. "Our religion is not the only one in the world," he had said. "I heard of another which follows only one God. Unlike our gods, that God is loving and kind to people. Someone said He made a way for people to go to heaven and actually live at peace with Him when they die." Meena yearned to hear more about this religion. Could this be the answer to her inner longings? Was this the way to really know God? "Tell me more," she had said anxiously. "What is that Way?" But Daju had not heard any more. He did not know the Way. 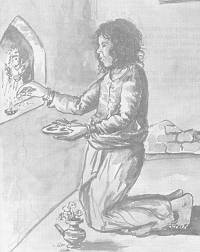 Meena was left with a hungry heart — desiring to know how to find peace, to know the truth, but with no one to tell her. Meena is lost. Lost forever and ever unless someone tells her about the Way, the Truth, and the Life. And there are millions more throughout Nepal and southern Asia who, like Meena, have never heard. Lost... lost... perishing without Jesus. It could be that God wants you to tell them the good news about heaven, Jesus Christ, salvation. Hopefully you are willing and happy to go if He sends you. But if He does not send you, will you pray for the Meenas of Asia and for the missionaries who are seeking to share with them the good news of salvation in Jesus? Copied with permission for WholesomeWords.org from Meena of Nepal by Linda Cloud. Way of Life Literature, ©1982.